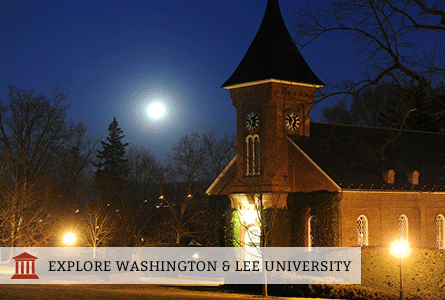 Washington and Lee is a liberal arts college located in Lexington, Virginia. At W&L, enjoy small class sizes and develop strong relationships with professors, while choosing from a variety of majors, minors and in-depth study opportunities through the College of Arts and Sciences or the Williams School of Commerce, Economics, and Politics. During spring term, many students participate in Spring Term Immersion, an intensive four-week course explores one topic of interest. Throughout the year, opportunities for research work in the natural sciences and humanities are plentiful and allow you to work either independently or in partnership with faculty. With over 130 student organizations to choose from, as well as club and varsity sports, service opportunities, speakers, concerts, movies and events all year long, life at W&L is never dull. Beyond campus life, soak up the great outdoors, an integral part of community and campus life at W&L. Located at in the heart of the Appalachian Mountains, W&L offers plenty of outdoor activities including canoeing, kayaking, biking, fishing, and hiking. Interesting fact: The Honor System at Washington and Lee allows students to schedule their own exams and take them without an administrator present. Libraries are also open 24/7 during the academic year.